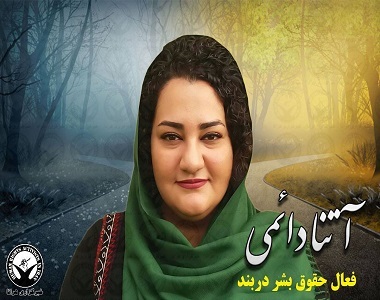 HRANA News Agency – Atena Daemi, imprisoned human rights activist was acquitted in the new case which was composed based on the complaint of the Iranian Revolutionary Guards. On the other hand the prohibition of prosecution was issued for Ms. Daemi’s complaining against the institution, Ms. Daemi objected to the decision. According to the report of Human Rights Activists News Agency (HRANA), on February 14, 2017, the prohibition of prosecution and acquittal of Atena Daemi in the new case had been assigned to her in prison. On January 17, 2017, the court session of Atena Daemi, imprisoned human rights activist, was held in Shahid Moghadas court in Evin prison. The allegations of insulting the supreme leader, insulting the authorities and spreading lies were dropped from the case and only the two allegations of insulting the officers during the arrest mission and hindering apprehension were heard. This change was done following the testimony of the police, defenses of the lawyer and refusal of recoding the arrest procedure. On February 15, 2017, the two sisters of Atena Daemi were acquitted of the accusation in Shahid Moghadas court in Evin prison. HRANA had previously reported that the court hearing of Atena Daemi was held in Shahid Moghadas court in Evin prison, for allegations of insulting the supreme leader, spreading lies, insulting authorities, beating the officers and apprehending the arrest on December 19, 2016. Ms. Daemi had mentioned during this session that she was the compliant and her supposed arrest date was for two days later. Need to be mentioned, Atena Daemi was arrested at 8 am in his father’s house on November 28. This arrest was along with use of excessive force and she was beaten and threatened by Sarllah forces of the IRGC and transferred to Evin prison in order to serve her 7 years in prison sentence. This civil rights activist sued the officers on the same day. Atena Daemi, 29, was arrested on October 21, 2014 and was held for 86 days in solitary confinement of ward 2-A. She was transferred to women’s ward of Evin prison on January 18, 2015. After several postponement of the court hearing, eventually in a court, presided by judge Moghiseh, judge of branch 28 of the Revolutionary Court in Tehran and in the presence of her solicitor and the other inmates (Omid Alishenas, Asuo Rostami, and Ali Nouri), she was charged with propaganda against the regime, gathering and collusion against the national security, insulting the Supreme Leader, insulting the Islamic Republic’s founder and concealing evidence of the crime because of her peaceful civil activities, and was sentenced to 14 years in prison on March 14, 2015. Previously, she was released by converting the detention to the bail at the appeal court, on February 15, 2016. Her sentence was reduced to 7 years in prison, in branch number 36 of the appeal court of Tehran by judge Ghomizadeh.